As per the data provided by U.S Bureau of Labor Statistics, the number of certified nursing assistants employed, in May 2013, was 52,090. The annual mean wage was $26,460, and the hourly wage was $12.72. Employment per 1000 jobs was 13.03. On December 2014, according to indeed.com, the average CNA salary in Michigan was $25,000. It was 1% higher in comparison to the average nurse aide income all over the country. Apart from these figures, there are a number of other things that influence the salary range in the state such as work locations and experience. In deciding the salary of a CNA, the employers also play an important role; however, candidates possessing experience are preferred in this occupation. 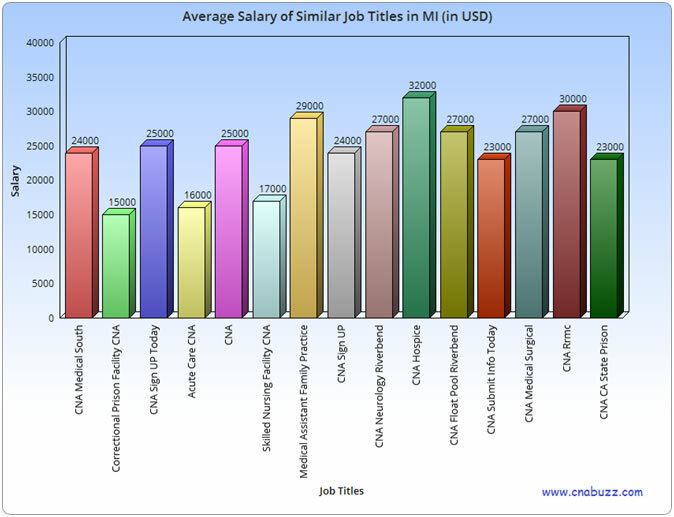 Read further to explore other details of CNA salary and job outlook in the state. The figures shown below will give you a detailed view of the wages of certified nursing assistants on different percentile brackets. 90% of CNAs made less than $34,420; 10% made more than $34,420. 75% of certified nurse assistants earned less than $29,740; the remaining 25% earned more than $29,740. 50% of the employees earned less than $26,380; the rest 50% earned more than $26,380. 25% of CNAs were paid annual wages less than $22,690; 75% were paid more than $22,690. 10% of employees were offered less than $20,000; 90% were offered more than $20,000. There are numerous cities in Michigan and every city provides different employment benefits, salaries, and opportunities. The maximum median annual salary ($32,012) is offered by Ann Arbor, Canton, and Novi. Muskegon pays the lowest salary i.e. $28,350 to a CNA. It can be concluded from the below given table that CNA Hospice earned the highest income of $32,000 while Correctional Prison Facility CNA were paid lowest, i.e., $15,000. The wages of other professionals range between $16,000 and $30,000. As per the statistics provided by the U.S. Bureau of Labor Statistics, the job growth for nursing assistants is predicted to grow by 21 percent in the upcoming ten years (2012-2022 decade). This expected growth rate is much faster as compared to other occupations. New job positions of around 312,200 are expected to emerge by the year 2022. Home health services and community rehabilitation services are expected to offer the best job opportunities. Question 1 – Presently, I am working as a CNA in the Livonia city of MI, and planning to move to Canton city. Is there any difference in the salaries provided in these cities? Answer – In both the cities, the median hourly salary of CNAs is same i.e. $15, but, the median annual salary is different. The annual pay in Canton ($32,012) is higher than Livonia ($30,612). Question 2 – Can anyone tell me some highest paying job titles? Answer – In Michigan, the highest paying job titles include CNA Hospice ($32,000), CNA Rrmc ($30,000), and Medical Assistant Family Practice ($29,000).